Catrake Force lies on the river Swale in beautiful Swaledale, one of the most attractive of the Yorkshire Dales. It consists a series of four steps, each its own small waterfall, and each with a very different character. The river in all falls 30 feet, the largest single drop on the series of falls being about 20 feet (6.1 metres). The series of waterfalls are particularly dramatic after heavy rain. 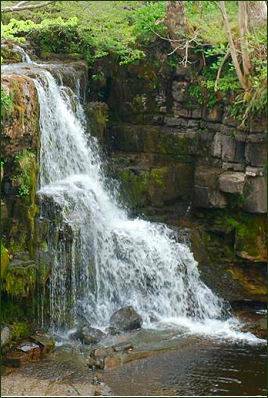 The waterfalls are around 0.5 miles (0.80 km) from the village of Keld and are situated on the Pennine Way Long Distance Trail. It lies downstream from Wain Wath Force. Just below Keld the river descends into a narrow gorge just above Catrake Force. 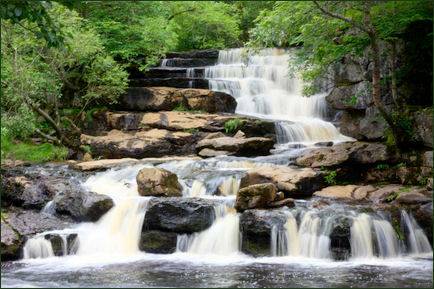 The next waterfall downstream is Kidson Force..
Waterfalls in the north of England are often termed Forces from the Old Norse word Foss which means waterfall, whilst Catrake derives from the Latin "cataracta" (waterfall) via Middle English. It is not visible from the road but requires only a short walk to reach it. Follow the track down into the campsite from the back of the car park in Keld. A narrow path then heads downstream where a restricted view can be had of two of Catrake Force's drops.